System 94S developed about 240 miles west-northwest of Darwin, Australia on Jan. 22, 2019. The next day, it had strengthened into a tropical cyclone, and was named Riley. 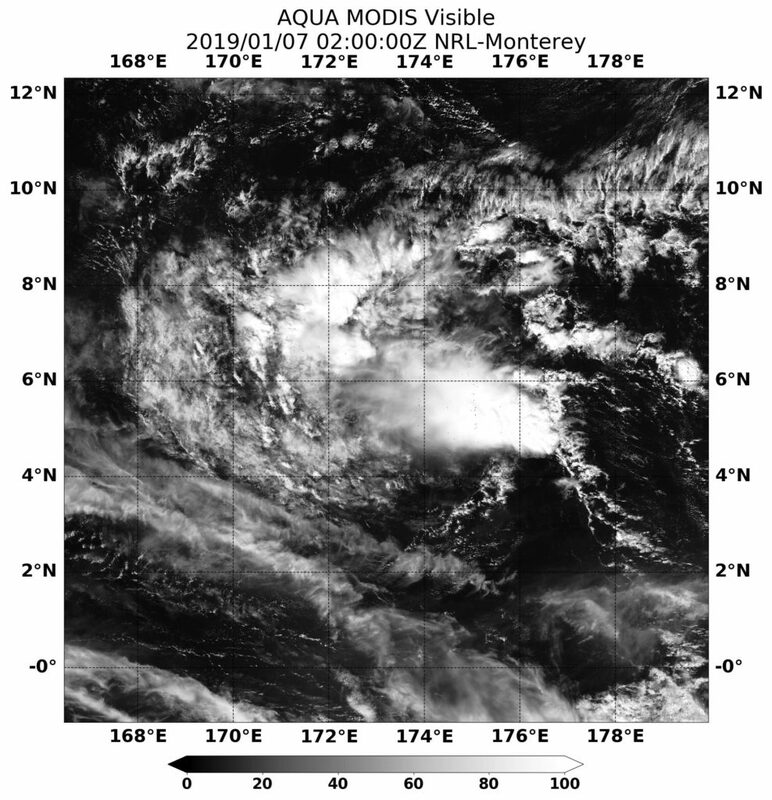 NASA-NOAA’s Suomi NPP satellite provided a look at Riley when it was closest to Australia. On Jan. 24, 2018, NASA-NOAA’s Suomi NPP satellite passed over Riley on Jan. 23 at 1:18 a.m. EST (0518 UTC). The VIIRS instrument aboard captured a visible image that showed the storm off the northwest coast of Western Australia. The storm had taken on the comma shape of a developed storm, and the southern quadrant of the storm was lashing the coast. When it developed on Jan. 22, the low pressure area known as System 94S had sustained winds near 35 kilometers per hour. The Australian Bureau of Meteorology (ABM) posted a Cyclone Watch for the northwest Kimberley coast on that day. On January 23, the ABM said Tropical Cyclone Riley continues tracking west, away from Kimberley coast. But the Tropical Cyclone Watch continued for the Pilbara coast. There was also a Blue Alert in effect for people between Whim Creek and Onslow including the towns of Roebourne, Wickham, Point Samson, Karratha, Dampier and Onslow. On Jan 23, Riley had maximum sustained winds near 85 kph. 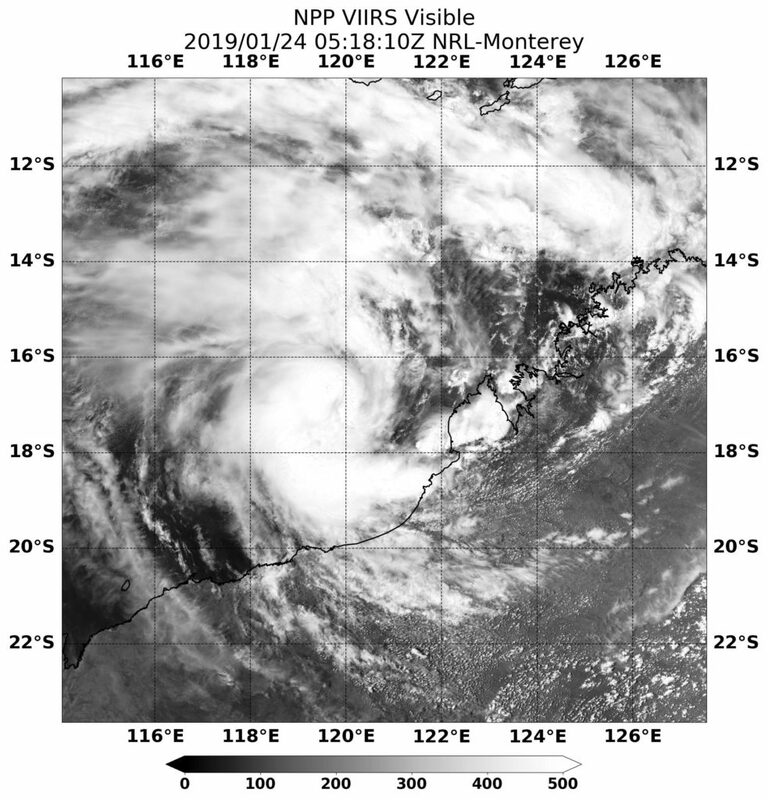 It was centered near 17.0 degrees South and 119.5 degrees East, approximately 310 kilometers west northwest of Broome and it was moving west. 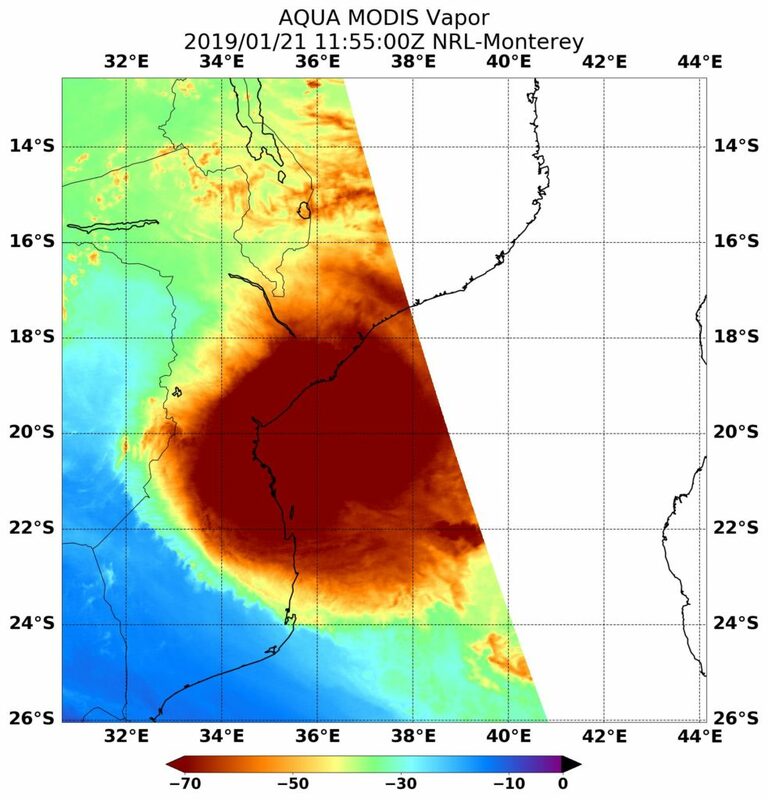 NASA’s Aqua satellite provided a look at the water vapor content within Tropical Storm Desmond as it was approaching landfall in Mozambique from the Mozambique Channel. 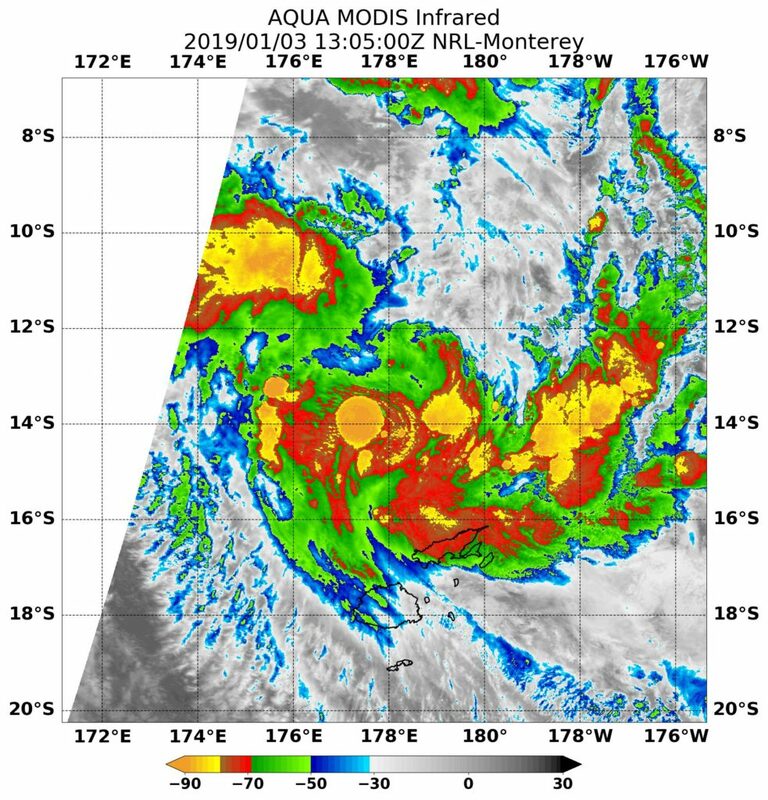 Tropical Cyclone Desmond formed in the Southern Indian Ocean on January 20, 2019 as Tropical Depression 10S. It strengthened into a tropical storm later that day. On January 21 at 4 a.m. EST (0900 UTC) Tropical cyclone Desmond was located near 20.1 degrees south latitude and 38.1 degrees east longitude, about 172 miles northwest of Europa Island. It was moving to the north-northwest and had maximum sustained winds near 35 knots (40 mph/65 kph). Desmond is moving toward Mozambique. On Jan. 21 at 6:55 a.m. EST (1155 UTC) the MODIS instrument aboard NASA’s Aqua satellite captured imagery of water vapor within Desmond. MODIS saw coldest cloud top temperatures were as cold as minus 70 degrees Fahrenheit (minus 56.6 degrees Celsius) in those areas. Storms with cloud top temperatures that cold have the capability to produce heavy rainfall. The image showed that the western side of Desmond was already bringing rain and gusty winds over the coast of Mozambique as it moved toward a landfall. Desmond moved northwest in the Mozambique Channel and made landfall in central Mozambique on Jan. 21 around 4 p.m. EDT (2100 UTC). Satellite imagery showed that Tropical depression 01 fizzled on January 6 after triggering a tropical storm watch on Jan. 5 for Mili, Ailinglaplap, Majuro, Kwajalein and Jaluit. Tropical Depression 01W formed on Jan. 4 near 4.8 degrees north latitude and 174.0 east longitude, about 217 miles southeast of Majuro, Marshall Islands. On Jan. 6 at 10 a.m. EST (1500 UTC) the Joint Typhoon Warning Center issued their final bulletin on 01W. At that time it was near 5.6 north latitude and 173.6 east longitude, about 169 miles east-southeast of Majuro. Maximum sustained winds dropped to 20 knots as it neared the Marshall Islands. 01W had weakened and no longer qualified as a tropical cyclone. On Jan. 7 at 0200 UTC (Jan. 6 at 9 p.m. EST), the MODIS instrument aboard NASA’s Aqua satellite captured a visible image of the dissipating storm. On January 8, the storm was reduced to a remnant low pressure area located 190 miles south of Majuro. 01W continued to linger in the Northwestern Pacific as a low pressure area, struggling to regenerate. A week later, on January 15, the low pressure area was still hanging around! The Joint Typhoon Warning Center still gave 01W a medium chance to regenerate. On that date, it was located about 160 miles south of Chuuk. Five days later, 01W was still hanging around and was 305 nautical miles east-northeast of Manila, Philippines. It was close enough to the country that it was given the name Amang, and triggered warnings. At 4 a.m. EST (0900 UTC) warnings were posted for the remnants of tropical cyclone 01W. Tropical cyclone warning signal #1 was in effect for the Visayas provinces of Northern and Eastern Samar, Samar, Biliran, Leyte. Signal #1 was also in effect for the Luzon provinces of Sorsogon and Masbate, including Ticao Island. On Jan. 22, the warnings had been dropped and the remnants from System 01W were near 12.0 degrees north latitude and 125.5 degrees east longitude, about 302 nautical miles east-southeast of Manila. Tropical Storm Pabuk formed and faded in the Northwestern Pacific Ocean. Pabuk was captured by NASA-NOAA’s Suomi NPP Satellite when it was a tropical storm in the Gulf of Thailand. NASA-NOAA’s Suomi NPP satellite captured a visible image of Tropical Storm Pabuk on Jan. 3, 2019 in the Gulf of Thailand. Credit: NASA Worldview, Earth Observing System Data and Information System (EOSDIS). NASA-NOAA’s Suomi NPP satellite captured a visible image of Tropical Storm Pabuk on Jan. 3, 2019 in the Gulf of Thailand. 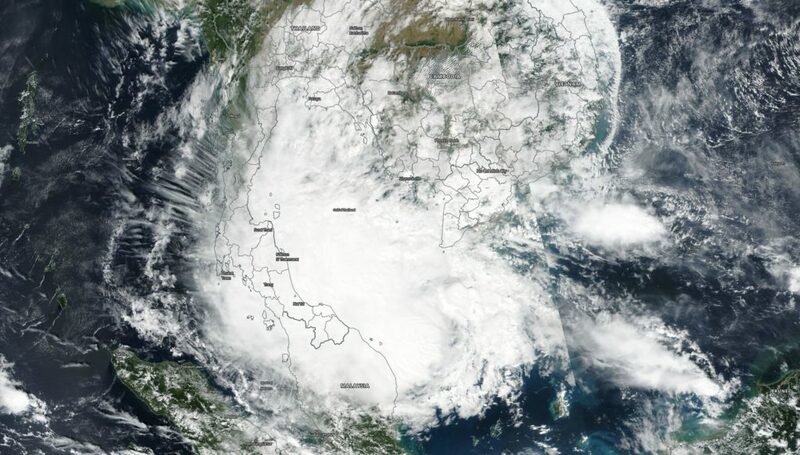 The image, taken from the VIIRS instrument showed the center of Pabuk’s circulation in the central Gulf as its western quadrant extended over the Malay Peninsula, while the eastern quadrant brought clouds over southwestern Cambodia. 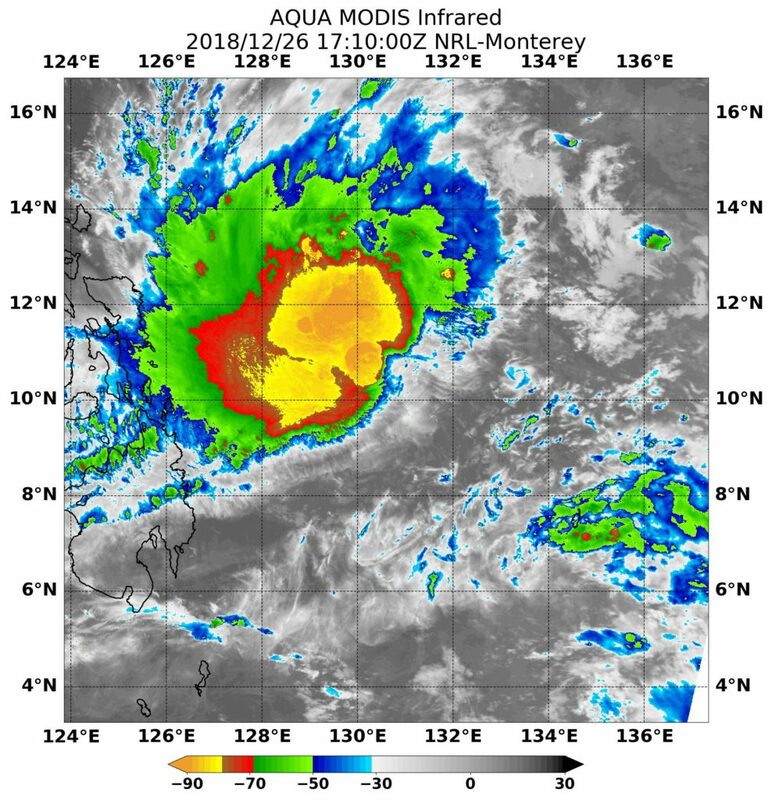 On Jan. 3 at 4 a.m. EST (0900 UTC) Tropical Storm Pabuk was centered near 6.0 degrees north latitude and 104.8 degrees east longitude. It was about 287 miles south of Ho Chi Minh, Vietnam and moving to the west. Maximum sustained winds were 35 knots (40 mph/65 kph). At that time, Pabuk was forecast to move west, later northwest into the Gulf of Thailand, and will peak at 50 knots (57 mph/92 kph). On Jan. 4, Pabuk was approaching landfall on the Malay Peninsula. The storm traversed the Malay Peninsula, and dissipated in the Bay of Bengal on Jan. 5. 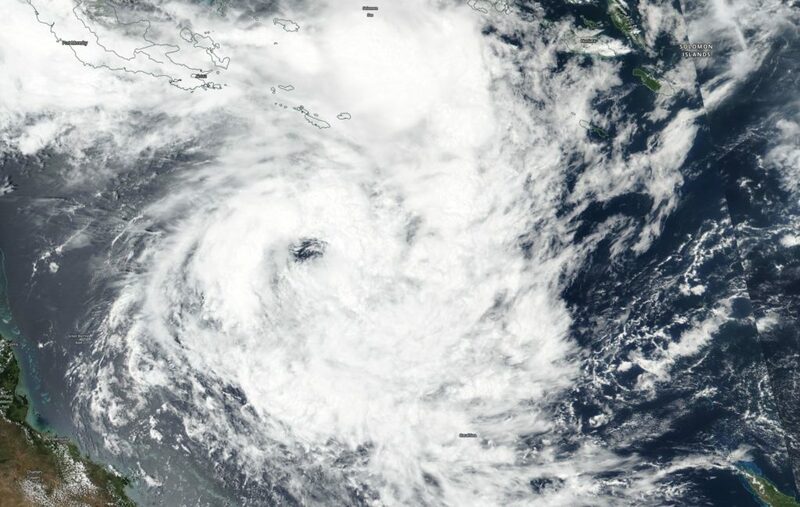 Tropical Cyclone Mona formed north of Fiji and triggered warnings. NASA’s Aqua satellite captured an infrared image of the storm providing cloud top temperatures. On Jan. 3, 2019, Regional warnings went into effect. A tropical cyclone alert was in force for Vanua Levu, Taveuni, Lau and Lomaiviti group of islands. On Jan. 3 at 4 a.m. EST (0900 UTC), Tropical cyclone Mona was located near 12.6 degrees south latitude and 178.2 degrees east longitude, about 330 miles north of Suva, Fiji. Mona was moving to the south and had maximum sustained winds near 35 knots (40 mph/65 kph). Mona is threatening Fiji. 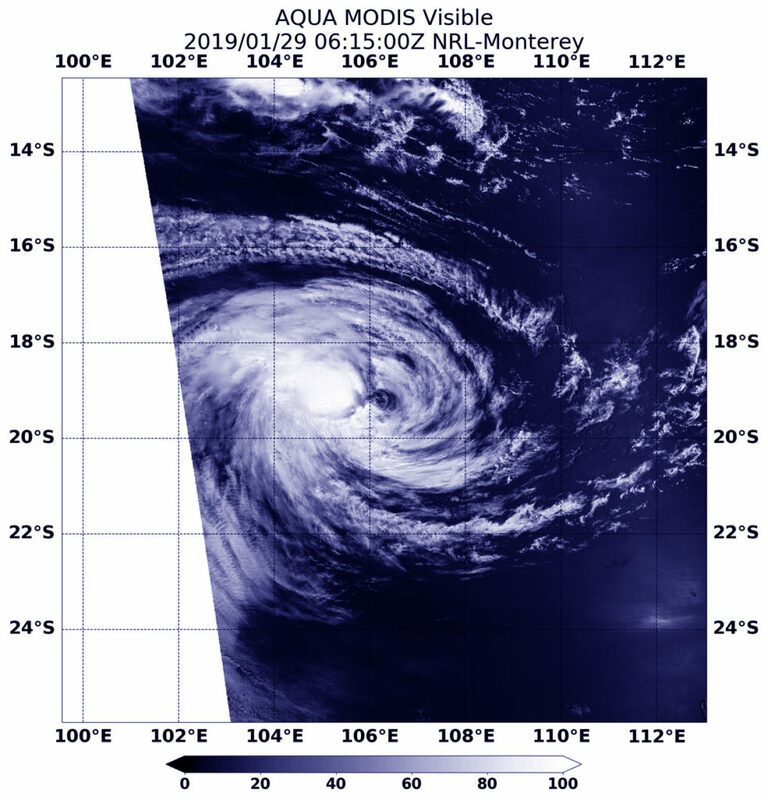 On Jan. 3, 2019 at 12 a.m. EST (0500 UTC) NASA’s Aqua satellite passed over the Southern Pacific Ocean and the MODIS instrument captured an infrared image of Tropical Cyclone Mona. MODIS found some very powerful thunderstorms with cloud tops as cold as minus 90 degrees Fahrenheit. On Jan. 4, Mona continued tracking toward Fiji and a tropical cyclone alert remained in place for the Yasawa group, Vanua Levu, Taveuni and the rest of Fiji. On Jan. 7, a tropical cyclone alert was in force for Vatoa and Ono-I-Lau. Mona’s maximum sustained winds were near 40 knots. At that time, the Joint Typhoon Warning Center noted that Mona is veering round to the southwest, through the eastern parts of the Fijian archipelago. The system dissipated later that day. Several satellites provided imagery on Tropical Storm Penny in the Southwestern Pacific Ocean. 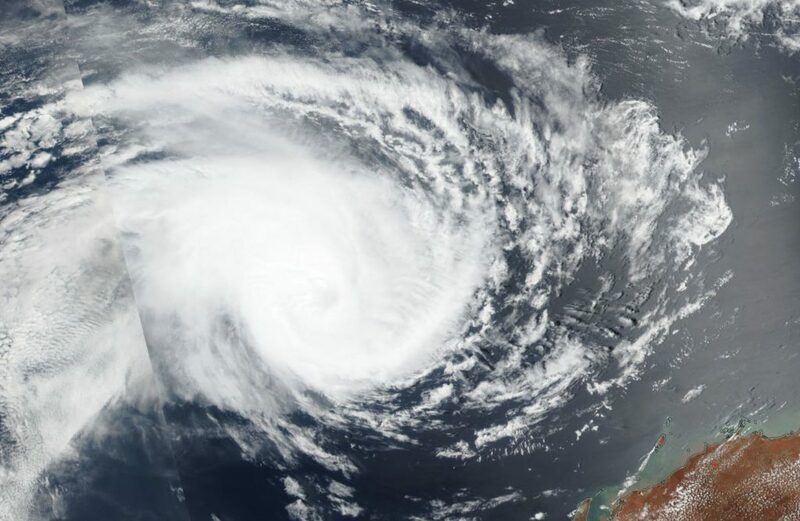 NASA-NOAA’s Suomi NPP satellite captured a visible image of the storm after it developed an eye. Tropical cyclone Penny / 08P formed in late December, 2018 and It strengthened into a tropical storm. By January 3, 2019 at 4 a.m. EST (0900 UTC) Penny had strengthened to 40 knots. It was located near 15.0 degrees south latitude and 153.7 degrees east longitude, about 470 miles east-northeast of Cairns, Australia. Penny was moving to the east-southeast. On January 3, 2019 Suomi NPP captured an image of Tropical Cyclone Penny in the Southwestern Pacific Ocean. Penny had developed an eye as it was moving across the Coral Sea. The next day at 4 a.m. EST (0900 UTC) Penny’s maximum sustained winds increased to 50 knots. By January 7, at 10 a.m. EST (1500 UTC) Penny was 347 miles east-southeast of Cairns, Australia and winds had decreased to 50 knots. Penny was moving west across the Coral Sea and on January 8, the Joint Typhoon Warning Center issued the final warning on the system as it was dissipating. Tropical Depression 35W brought heavy rainfall and flooding to the Bicol and Eastern Visayas regions of the Philippines in late December 2018. Infrared imagery from NASA’s Aqua satellite found very cold cloud top temperatures in 35W, indicating powerful rain-making storms. Locally in the Philippines, Tropical Depression 35W was known as Usman. On Dec. 26, Tropical Depression 35W had triggered warnings in the Philippines. Tropical cyclone warning signal #1 was in force in Eastern Samar in the Visayas region. At 10 a.m. EST (1500 UTC) 35W was located near 10.0 degrees north latitude and 130.6 degrees east longitude, about 627 miles east-southeast of Manila, Philippines. 35W was moving to the west and at that time had maximum sustained winds near 25 knots (28.7 mph/46.3 kph). On Dec. 26, 2018 at 12:10 p.m. EST (1710 UTC) NASA’s Aqua satellite passed over the Northwestern Pacific Ocean and the MODIS instrument captured an infrared image of Tropical Depression 35W. MODIS found some very powerful thunderstorms with cloud tops as cold as minus 90 degrees Fahrenheit (minus 67.7 degrees Celsius). NASA research has shown that cloud tops with temperatures that cold can generate very heavy rainfall. On Dec. 27 at 4 a.m. EST (0900 UTC), Tropical Depression 35W was about 579 nautical miles east-southwest of Manila, Philippines. It was centered near 10.4 degrees north latitude and 129.9 degrees east longitude. 35W was moving west-northwest and maintained maximum sustained winds near 25 knots (28.7 mph/46.3 kph). 35W moved west and made landfall on Dec. 29. It crossed the central Philippines where it dropped heavy rainfall, and created flooding and landslides. 61 people were reported killed from the flooding on Dec. 31. Tropical Depression 35W moved into the South China Sea where it dissipated.